Surface wave tomography, using the fundamental Rayleigh wave velocities and those of higher modes between 1 and 4 and periods between 50 and 160 s, is used to image structures with a horizontal resolution of ∼250 km and a vertical resolution of ∼50 km to depths of ∼300 km in the mantle .A new model, PM_v2_2012, obtained from 3× 106 seismograms, agrees well with earlier lower resolution models. It is combined with temperature estimates from oceanic plate models and with pressure and temperature estimates from the mineral compositions of garnet peridotite nodules to generate a number of estimates of SV(P, T) based on geophysical and petrological observations alone. These are then used to estimate the unrelaxed shear modulus and its derivatives with respect to pressure and temperature, which agree reasonably with values from laboratory experiments. At high temperatures relaxation occurs, causing the shear wave velocity to depend on frequency. This behaviour is parameterised using a viscosity to obtain a Maxwell relaxation time. The relaxation behaviour is described using a dimensionless frequency, which depends on an activation energy E and volume Va. The values of E and Va obtained from the geophysical models agree with those from laboratory experiments on high temperature creep. The resulting expressions are then used to determine the lithospheric thickness from the shear wave velocity variations. The resolution is improved by about a factor of two with respect to earlier models, and clearly resolves the thick lithosphere beneath active intracontinental belts that are now being shortened. The same expressions allow the three dimensional variations of the shear wave attenuation and viscosity to be estimated. frequency, which depends on an activation energy E and volume Va. The values of E and Va obtained from the geophysical models agree with those from laboratory experiments on high temperature creep. The resulting expressions are then used to determine the lithospheric thickness from the shear wave velocity variations. The resolution is improved by about a factor of two with respect to earlier models, and clearly resolves the thick lithosphere beneath active intracontinental belts that are now being shortened. The same expressions allow the three dimensional variations of the shear wave attenuation and viscosity to be estimated. The association of reduced shear wave velocity V s, increased attenuation and reduced viscosity in the Earth’s upper mantle has been known for almost ninety years (see Gutenberg, 1959, p. 76). These effects are most obvious in the asthenosphere, where the mantle temperature approaches the melting temperature. Fig. 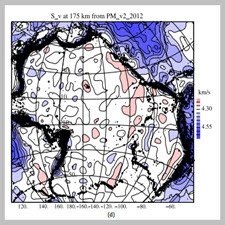 1a shows a typical steady state continental geotherm. The layer close to the surface, where heat is transported by conduction alone, is known as the mechanical boundary layer (MBL). It is underlain by a thermal boundary layer (TBL) that forms part of the convective circulation of the upper mantle, and which supplies heat to the base of the MBL. توموگرافی موج سطح، با استفاده از سرعت موجهای بنیادی Rayleigh و حالتهای بالاتر از 1 تا 4 و دورههای بین 50 تا 160 ثانیه، برای ساختارهای تصویر با رزولوشن افقی حدود 250 کیلومتر و وضوح عمودی 50 کیلومتر تا عمق از ~300 کیلومتر در گوشته. مدل جدید، PM_v2_2012، به دست آمده از 3 × 106 لرزه نگاری، به خوبی با مدل های با وضوح پایین تر موافق است. این ترکیب با برآورد دما از مدل صفحات اقیانوسی و با برآورد فشار و درجه حرارت از ترکیبات معدنی گره نویسی پراودوتیت گره ها برای تولید تعدادی برآورد SV (P، T) بر اساس مشاهدات ژئوفیزیک و سنگ شناس تنها در ترکیب است. سپس آنها برای تخمین مدول برشی غیرمعمول و مشتقات آن با توجه به فشار و دمای مورد استفاده قرار می گیرند که به طور منطقی با مقادیر آزمایش های آزمایشگاهی موافقند. در دمای بالا، آرامش رخ می دهد، باعث می شود سرعت موج برش به فرکانس بستگی دارد. برای به دست آوردن زمان آرامش ماکسول، این رفتار با استفاده از ویسکوزیته پارامتر می شود. رفتار آرامش با استفاده از یک فرکانس بدون بعد، که بستگی به انرژی فعال E و حجم Va دارد، توصیف می شود. مقادیر E و Va که از مدل های ژئوفیزیکی حاصل می شوند، با آزمایشات آزمایشگاهی بر روی خزش درجه حرارت بالا مطابقت دارند. سپس عبارات حاصل برای تعیین ضخامت لیتوسفری از تغییرات سرعت موج برشی استفاده می شود. این رزولوشن در حدود دو برابر نسبت به مدل های قبلی بهبود می یابد و به وضوح لیتوسفر ضخیم زیر کمربندهای داخل قلبیشناسی را که در حال حاضر کوتاه تر می شود را حل می کند. اصطلاحات مشابه، برآورده می شود که تغییرات سه بعدی موجب تضعیف و گرانروی موج برشی می شود. ارتباط کاهش سرعت موج برشی Vs، افزایش انقباض و کاهش ویسکوزیته در گوشته بالای زمین برای تقریبا 90 سال شناخته شده است (گوتنبرگ، 1959، ص 76). این اثرات در آستنوسفر واضح تر است، جایی که دمای گوشته به دمای ذوب بستگی دارد. شکل 1a یک ژئوترم قاره ای معمولی ثابت را نشان می دهد. لایه مرز مکانیکی (MBL) به لایه نزدیک به سطح، جایی که گرما تنها به وسیله رسانا حمل می شود، شناخته می شود. این یک لایه مرزی حرارتی (TBL) است که بخشی از گردش کنترلی گوشته بالایی است و گرما را به پایه MBL متصل می کند.